Facciamo festa! With our favorite food people in town from Italy and from all over the USA for the Fancy Food Show, the obvious thing to do is party. And what better way to celebrate than doing what we do best, eating and drinking! Where: At Celeste’s Di Fiore – 15 East 12th St., between Fifth and University Pl. What: Dinner by invitation, only. Names at the door. Celeste will close her restaurant for the evening. On June the 30th, her charming restaurant will be only for us, for Gustiamo and Friends. It will be like dining at home. It’s a lovely home, a time capsule; in fact the restaurant, which is in a terrific location (across the street from Gotham Bar & Grill) has not been touched for thirty years. 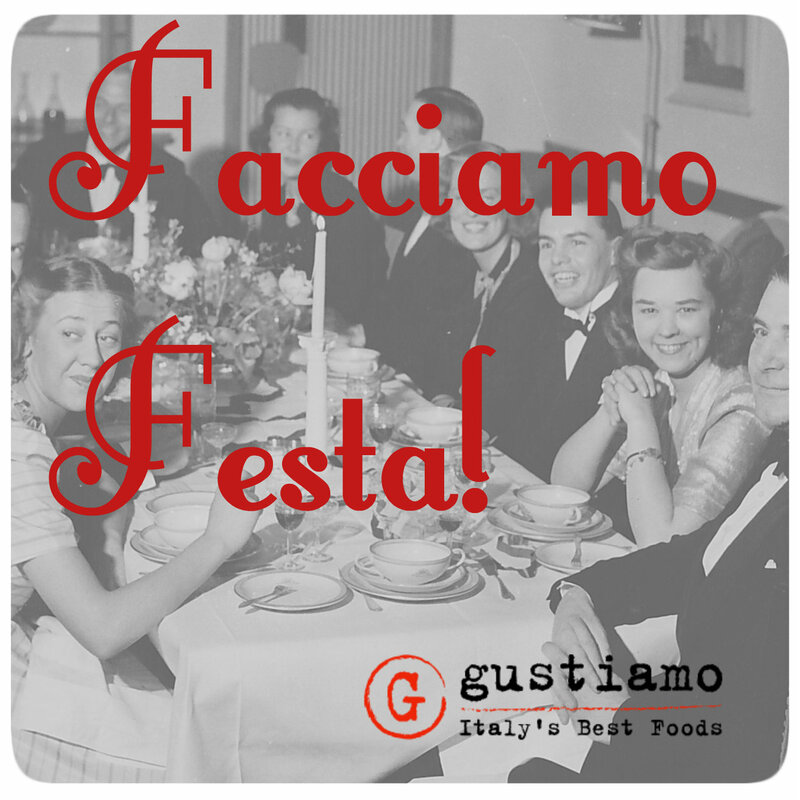 This dinner is to celebrate you, Gustiamo’s good friends. We also want to honor our heros, the Italian producers: Paolo, the farmer who grows Real San Marzano Tomatoes in Agro Sarnese Nocerino; Dario, the farmer who grows Piennolo Tomatoes on Mount Vesuvio; Sergio, who makes Pasta Faella in Gragnano; Lorenzo who makes Pianogrillo EVOO in Sicily. They will all be in town for the Fancy Food Show (Booth #5363) and we want you to meet them. Fuori (outside) the Fancy Food Show. Therefore, this is a #FuoriFancy dinner. Chef Gerardo Guarino will prepare a menu that has been created, finalized and perfected through what it felt like interminable conversations with Paolo, Dario, Sergio and Lorenzo, who are still in Italy. Thank you, Skype. Do you want to see the menu? Here it is. If you do not know what Barzanella is, you’d better come to dinner! The producers, Team Gustiamo, Celeste and chef Gerardo Guarino are looking forward to seeing you. Hope you can make it! RSVP, pls, to Beatrice (beatrice.u@gustiamo.com). Remember, your name will be at the door!